Anti-Semitic incidents reported in Britain dropped by over a fifth last year, a Jewish security advisory group said Thursday, noting that the figure still remains the third-highest on record. The Community Security Trust (CST) reported there were 924 anti-Semitic incidents during 2015, including a total of 86 violent attacks. While the overall figure was a 22 percent drop from the 1,168 incidents in 2014, CST Chief Executive David Delew asserted the number was still "unacceptably high." "The Jewish community has a right to expect anti-Semitism to be opposed wherever it occurs," he declared in a statement. "It should have no place in our society." The UK's Home Secretary Theresa May likewise welcomed the fall in anti-Semitic incidents, but stressed "there are still too many cases of this type of hate crime." It is worth noting that 2014's figures were particularly high due to the massive spike in anti-Semitic crimes during Operation Protective Edge in Gaza that summer. Jews across Europe have become increasingly concerned by a surge in anti-Semitic incidents, with fears only exacerbated by last year's deadly attacks on a Jewish supermarket in Paris and a synagogue in Copenhagen. A survey last year found that a quarter of British Jews have considered leaving the country while almost half expressed fears they have no long-term future in Britain or Europe. However, despite those figures anti-Semitism in the UK is nowhere near the rampant levels in countries on mainland Europe such as France or Belgium, and the number of violent anti-Semitic attacks is still relatively low. 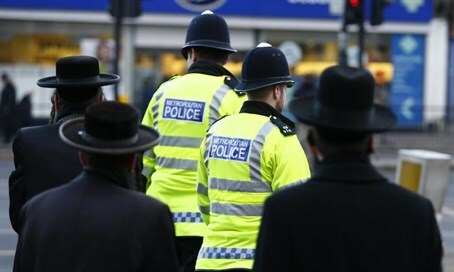 In its report, the CST said most of the incidents involved the random use of racial slurs, with nearly 75% of all incidents taking place in or around London and Manchester - home to Britain's biggest Jewish communities. The CST noted that it also suspected many isolated anti-Semitic incidents have not been reported to the organization or police.